I have a sweet tooth. Big time. Giving up my sweets was one of the biggest and most difficult hurdles for me when I went Paleo. I haven’t looked back, even for an instant, and the health benefits of cutting the sugars out of my diet have been undeniably amazing, not to mention that I am no longer ruled by my cravings… But every once in a while I like to be indulgent. I indulge in avocado, grass-fed stewed short ribs… There’s no reason I can’t occasionally have an amazing “sweet salad” to pick me up in the morning, right? So this morning I took a little extra time putting together my salad, and made it a “Sweet Salad”. Not in the traditional sense – it wasn’t sugar laden. It was a special combination of ingredients, all of which are fantastically good for you, designed to give the satisfaction of having had a sweet indulgence, without the guilt! Baked Maduros: These need to be done ahead of time. My wife and I love eating these as a desert on some nights, or as a side to our steak meals. You’ve seen these show up fairly regularly on my blog, because they’re delicious! So here’s how you make these: pre-heat the oven to 325. While the oven is heating up, slice the Ripe Plantains in to long thin slices (no more than 1/2 inch thick; and at least 2.5 inches in length, longer is better). Lightly oil a baking pan with coconut oil. Maduros will absorb the oil while baking, so you may need to add some more coconut oil later too – you’ll have to pay attention for that. Place the sliced plantains in the baking pan and bake for 15 minutes. At 15 minutes, flip them over with tongs (they can get sticky! ), add more oil, if necessary, and put them back in for another 10 minutes. Once these are done (lightly browned on each side), take them out of the oven and let them cool before serving (or storing them, in this case). They’re best served a little warm, and they keep really well for meals later in the week. It’s a salad, so the short version of the directions is this: chop all the ingredients, combine them, and toss them. Ok, that’s done. Now let’s talk about how I did it! 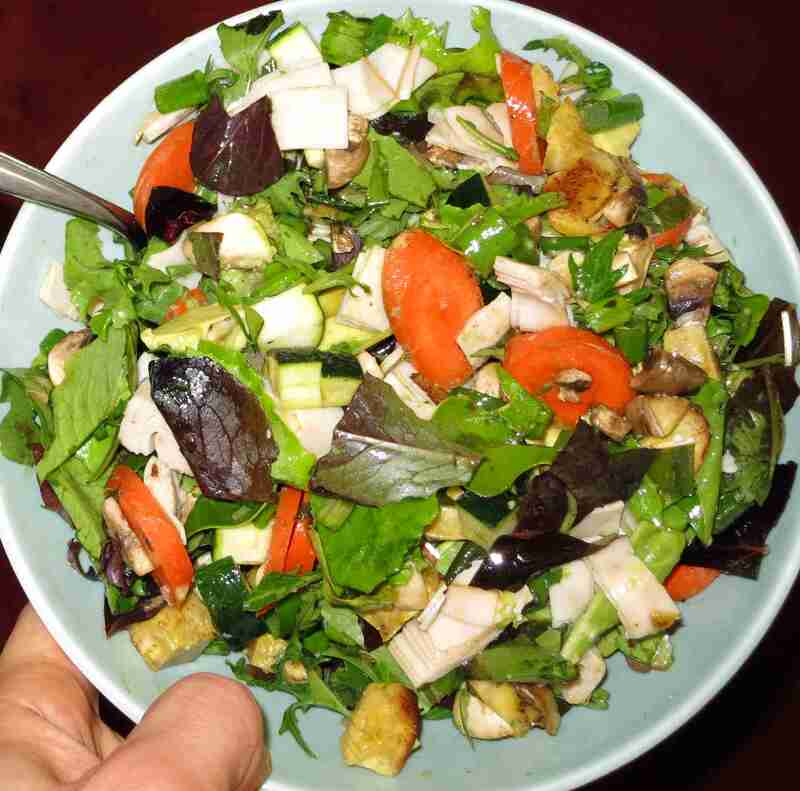 As above: chop up the salad greens, carrot, zucchini, baked maduros, and avocado and mix them in a bowl. On top of this, add the chopped mushrooms, then drizzle the hazelnut oil over the mushrooms. I’ve come to appreciate that the oil gets absorbed by the mushrooms, and the mushrooms, since their natural flavor is so mild and complimentary anyway, end up tasting like the oil. With hazelnut oil, that can be a very “sweet” tasting flavor! Last, add the turkey, and mix again. Et Voila! You have your very own “Sweet Salad” for breakfast! Additional or alternate ingredients: If you have it, you could add some dried fruit to the meal. A dried apple or mango would likely support the flavor of the meal nicely! Similarly, a specialty vinegar, like a raspberry vinegar, could really make this amazing. Finally: if you have the time, you can add the carrots to the baking pan and bake the carrots with the maduros – the end result will be that much more sweet and savory! Lastly, I would warn against adding any actual hazelnuts – they’re not very “sweet” like the hazelnut oil, and will interfere with the flavor profile of the meal. I hear ya on the sweet tooth! I didn’t realize hazelnut oil was sweet! I’ve eaten the nuts and even made a Nutella-like hazelnut chocolate butter, but never tried the oil. My pleasure! It’s been one of my not-so-guilty pleasures for months now – I dip in to it when I’ve got a sweet-tooth craving, and it always takes good care of me! Yeah, I’ve been looking for some raspberry vinegar – had some in VT a while back and it’s been on my mind! Thanks Noah! Haven’t heard from you in a while here. Good to have you back! ← Eating Out In D.C.